This famous, award-winning spelling program by Beverly L. Adams-Gordon just became better. Now featuring 21st century technology, it still teaches solid back-to-basic spelling skills. Since 1994, Spelling Power has given home educators the perfect way to teach comprehensive spelling skills to their whole family. Your students will use this research proven program to master the 5,000 most frequently used words. These words are divided into 11 levels based on their usage. Each level of Spelling Power’s unique word list is then further organized by phonetic principles and spelling rules. Additional words that your students needs to master are taken from your student’s own writing errors and added to your Spelling Power program using the provided resources. Your students continue to study each of these words until they have spelled them correctly at least once. Then Spelling Power’s spiral curriculum approach of repeated, spaced review assures your students will master every word they study. And your students will master them! Spelling Power’s six levels of built-in review guarantees that every word taught will be mastered. Multi-sensory study steps, inductive learning activities, interesting skill-building activities and games, and the incorporation of spelling into the rest of your curriculum are integral aspects of Adams-Gordon’s Spelling Power program. Everything you need to teach each of your students spelling skills to the college level is contained in this one easy-to-use, step-by-step curriculum package. You’ll even find everything you need to know to teach them proofreading and dictionary skills. -- a 21st Century tool that makes spelling drill fun and trackable. Even if you are new to teaching, you’ll find that Spelling Power’s all new, easy-to-understand Quick Start Steps and the included Quick Start DVD Seminar will help you give each of your students Spelling Power in just 15 minutes per day! As with previous editions, Canadian/British spellings are included in both the Flow-Word-Lists and the Searchable Word List to make it easier for non-American spellers to use. These alternate spellings appear in brackets behind the American spellings in the Flow-Word Lists (for example: color [colour]). In the Searchable List, the words appear in the correct alphabetical sequence, with a reference to the alternate spelling. This allows individual teachers to decide which spelling convention to teach. For one low price you get the Spelling Power teacher’s manual, the Teacher’s Resource CD-ROM, and the Quick Start DVD Seminar. This one curriculum package is all you need to meet your entire family’s spelling instructional needs for a lifetime. Don’t be fooled by imitators… your family deserves the original "big Orange" Spelling Power program written for home educators by a home educator. Spelling was the "Achilles heel" of our homeschooling program. It was the area where we let up our guard and fell behind. We were so interested in those subjects that were so full of interesting content that we ceased to be diligent in teaching spelling past the sixth grade. When they were younger, they did well on their spelling tests, but they did not remember the words well enough to apply them to their creative writing assignments because the other spelling curricula did not teach spelling according to a phonetic plan. Remember, Phonics isn’t enough. In addition to Phonics, your children need Spelling! As we evaluated our sons creative writing assignments, we became painfully aware of this oversight on our part. At that point in time, our oldest son was past the sixth grade and we needed to find a spelling program that would work well for older children as well as the little ones. Also, remember, when kids use the computer, even though the "spell check" program is a really cool utility, it can turn them into "lazy spellers" and actually keep them from learning how to spell. That’s when we found SPELLING POWER--the one program that will work for all ages of children from the second grade through high school. Its the ONLY PROGRAM YOU’LL EVER NEED TO BUY FOR ALL OF YOUR CHILDREN FOR ALL OF THE YEARS OF THEIR EDUCATION. Spelling Power takes the 5,000 most commonly used words in the English Language and divides them into 11 levels of frequency of use, then each level is divided into 47 possible groups based on Phonetic principles or spelling "rules". When you begin, you give your children a series of placement tests that will determine their current level of proficiency and start them off at just the right place. That means that each child begins exactly where he is academically -- your second grader will not necessarily be working on a "second" grade list. Instead, he begins with the words he does not know. This really is a big plus for the "natural spellers," because they dont have to study words they already know. It is the only way to go with the non-visual learners (great readers who just can’t spell -- despite excellent phonics training), because it allows them to begin with words they will actually use, giving them instant improvement in their writing ability. Each list has about ten to forty words to master. And, there’s a review test every fifth list. The review test is the first of the six levels of built-in review the Spelling Power program provides. This repetition is what assures every word is indeed learned and added to your child’s written vocabulary. Each Spelling Power daily session takes about 15 minutes for your child (only 5 minutes of that requires direct teacher involvement). First you will pre-test your child from the organized word lists, then your child will study the words he misspells, and finally he will be engaged in a fun, effective learning activity to drill the spelling word or emphasize a spelling principle. They will say the word, spell the word aloud. They will write the word on paper and visualize the spelling in their minds with their eyes closed. They will use the words in sentences. (I wish I had known this method when I was a kid learning to spell.) Because they are only studying the words they missed (2 to 3 words at a time) it only takes about another five minutes to study the words. After studying each missed word the child completes a fun activity. Generally, each list will take about one week. If you will be faithful to devote only fifteen minutes a day to SPELLING POWER, you will see your children become excellent spellers. Your student will do his work on forms provided in the manual, which you can duplicate, if you wish. However, it will be much easier if you will use SPELLING POWER Student Record Books which are availabe for a very nominal cost. 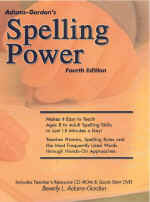 Each book provides enough forms for one student to master the words on at least one level of the Spelling Power program. Each book is conveniently bound with all forms for test taking printed in light blue. There are games, puzzles, and writing project assignments for children of all ages. Each five to ten minute project is on an index card which is color coded according to ability level. There are hundreds of individual projects which have been designed for you in the Teachers Manual, greatly reducing your lesson planning time. You can use these cards during SPELLING POWERs five minute "activity time." And it’s easy to learn to use SPELLING POWER. At the beginning of the program, there is a "Quick Start" guide. If you want the author to show you how to use the product, you can purchase a QUICK START VIDEO where you can see it demonstrated. The FUN part of the Spelling Power program! Maybe you have the 3rd Edition and you want to continue to use it. Maybe you purchased one used from a friend, but you would like someone to explain to you how to use it. If you would like to have a seminar taught by the author in your home to help you get started more quickly, this is what you’re looking for. She teaches you step by step how to using the program. You will learn something new every time you view it. Each book provides enough forms for one student to master the words on at least one level of the Spelling Power program. Each book is conveniently bound with all forms for test taking printed in light blue. Available in four sizes of line. Each child needs his/her own Record Book for testing taking and daily practice. Activity Task Cards are the fun way to master spelling words and strengthen language arts skills. They give you hundreds of ways to make spelling easy-to-teach and easy-to-learn. Covers interest and ability levels ranging from eight years old to adult level.